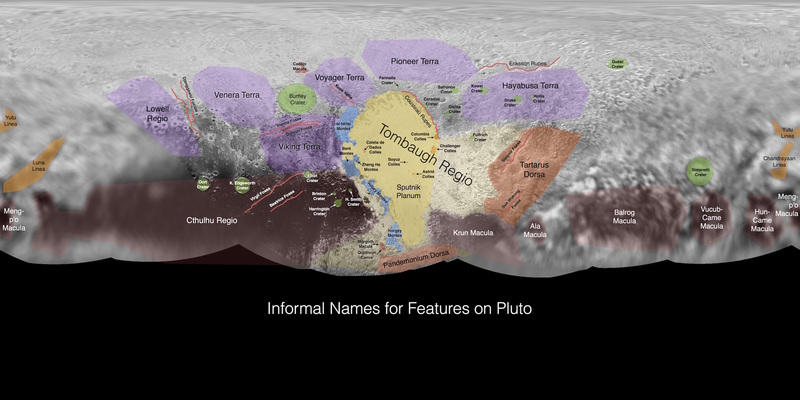 July 31, 2015 – The New Horizons team has released a series of maps showing the initial, informal names being used for the features and regions on the surfaces of Pluto and Charon. Names were selected based on input received during the worldwide “OurPluto” naming campaign initiated by NASA and the International Astronomical Union (IAU) in the spring of 2015. The IAU is the formal authority for naming celestial bodies. Submissions must follow a set of accepted themes and guidelines set out by the IAU’s Working Group for Planetary System Nomenclature. After the public campaign ended, the New Horizons team reviewed more than 40,000 names and submitted its recommendations to the IAU. The IAU will now determine whether and how the names will be used. In the meantime, the NASA New Horizons spacecraft flew through the Pluto system, with its closest approach on July 14, and the New Horizons team has given informal names to some prominent features on Pluto and its largest moon, Charon. 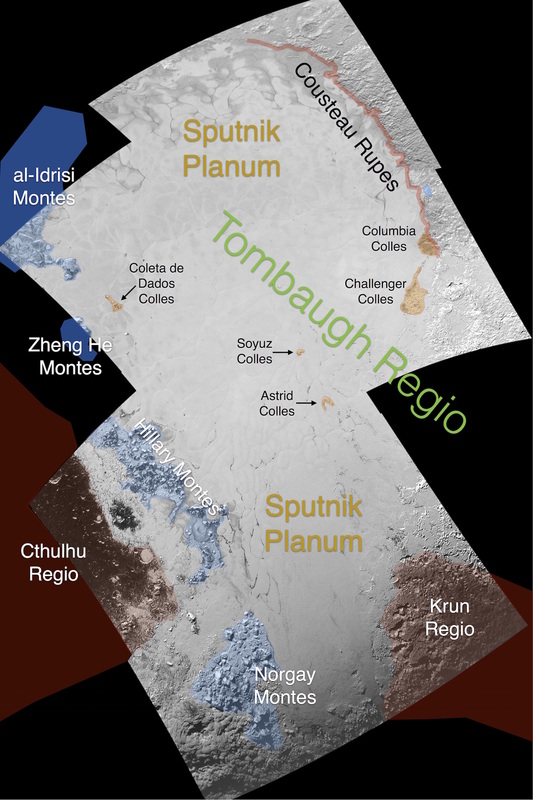 The “heart” of Pluto is referred to as “Tombaugh Regio” after the man who discovered Pluto in 1930, Clyde Tombaugh. Other features on Pluto are named after historic explorers, early space missions, scientists and engineers, and underworld beings. The features on Charon are named after authors and artists, fictional travelers, fictional vessels and fictional destinations. 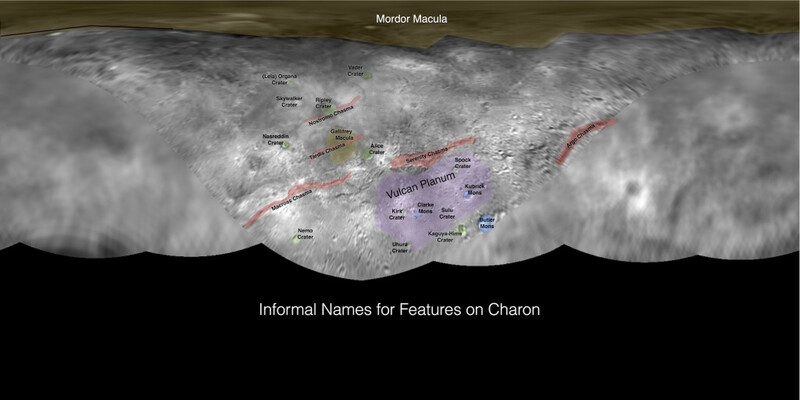 Well-known names from Star Trek, Star Wars, and other popular entertainment can be found on the latest map of Charon. For a full explanation of the names, click here. The John Hopkins Applied Physics Laboratory (APL) manages the New Horizons missionfor NASA’s Science Mission Directorate in Washington. Alan Stern, of the Southwest Research Institute (SwRI) in Boulder, Colorado, is the principal investigator. SwRI leads the science team, payload operations and encounter science planning. New Horizons is part of the New Frontiers Program, managed by NASA’s Marshall Space Flight Center in Huntsville, Alabama. APL designed, built and operates the spacecraft for NASA.